It is a well known tradition that every year we must cook enough turkey on Christmas day to feed the five thousand. After scanning the supermarkets for the biggest turkey man can find, then finding a way to fit the bird in the fridge or a bigger challenge the freezer and after waiting for hours on Christmas day for it cook….you will not want to waste any of the leftovers. Leftovers is all part of the festive fun, whether we are sandwiching, adding into curries, freezing for future endeavors……we are always seeking new ways to avoid wasting a tasty turkey morsel. This terrine is a perfect way to use up any turkey and ham leftovers, it is simple to make, looks great on the plate and is super tasty. -Preheat oven to 170°C. Grease a 1kg loaf pan with oil, then line with slices of prosciutto, overlapping them and leaving the ends of the prosciutto to hang over the side of the pan. -In a large bowl, mix together the turkey mince, parsley, leftover stuffing, turkey and ham. Put all the mixture into the loaf tin, press down hard to make sure there is no air gaps. Smooth the top, then fold the overhanging prosciutto over the mixture and cover the pan with foil. -Place the terrine in a large, deep roasting tray and fill the tray with enough hot water to come halfway up the sides. Bake for 1 1/2 hours. 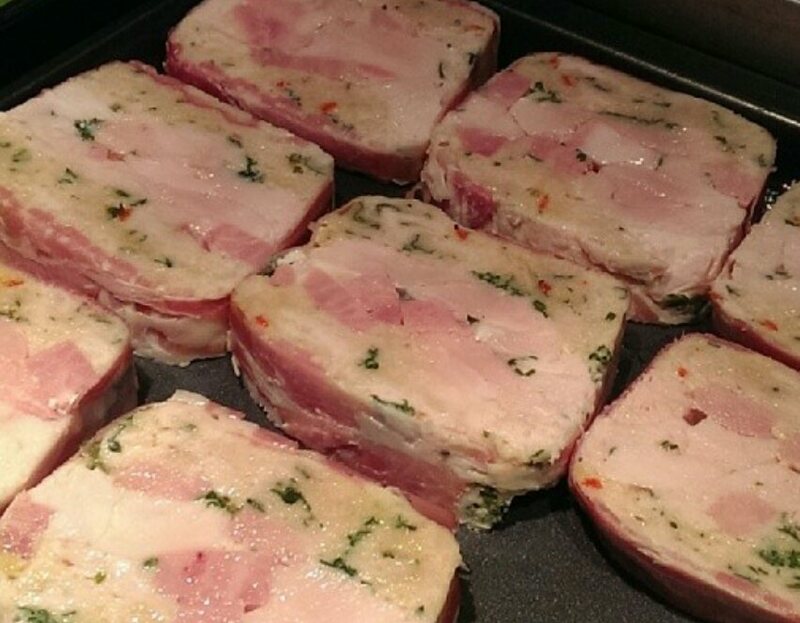 Remove terrine and place on a tray. Weigh down with a couple of cans or a brick covered in foil. Refrigerate overnight. I made this once for a Christmas dinner party. To ‘posh’ it up I served it with a fresh pea puree, duchess potatoes & Bacon wrapped brussels. Next Bacon Wrapped Brussel Beauts! Very delicious dish. I love turkey and ham. I would love to try to make this on the special event coming up.